You can find and insert a picture from your local device or an online source. For example, you can add an official company logo in a local folder to a network diagram, or search for a picture on the Web to add color and interest to a business roadmap diagram. A variety of file formats are supported. Each picture can be up to 6 MB in size. On the ribbon, select Insert > Picture from device . In the Choose File to Upload dialog box, locate a picture, and then select Open. The picture is added to the diagram. You can drag it to another location. On the ribbon, select Insert > Picture from Web . 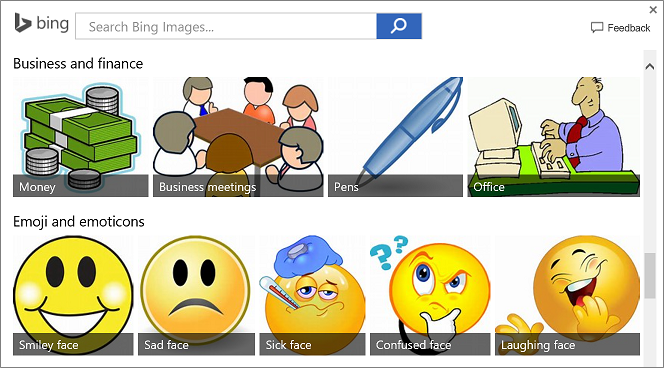 In the Bing search window, enter a search term to locate a picture. Once a picture is inserted, you can make necessary adjustments. Move, resize, cut, copy, and paste the picture in the same way as a shape. For more information, see Select, copy, and move shapes in Visio Online. To change the size, drag one of the selection handles that appear on the sides and corners. For more information, see Change the size, rotation, and order of a shape in Visio Online. To change the picture outline and color, select Home > Line and then select a theme or standard color..
You can also change the line weight and type. To rotate the picture, select Home > Arrange Shapes , and then select Rotate right 90 degrees or Rotate left 90 degrees. You can also drag the Rotate handle on the picture in a circle. 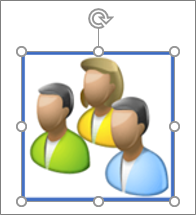 To send the picture forward or backward, select Arrange Shapes , and then select one of the Reorder commands. Add alternative text to the picture. For more information, see Make a Visio Online diagram accessible.